Kristen Stewart Totally Crashed A Wedding — But She Isn’t The Only Celeb! On Saturday, Kirsten and Kayleigh Jennings got married in Winnipeg after meeting seven years ago while bartending in the Cayman Islands. 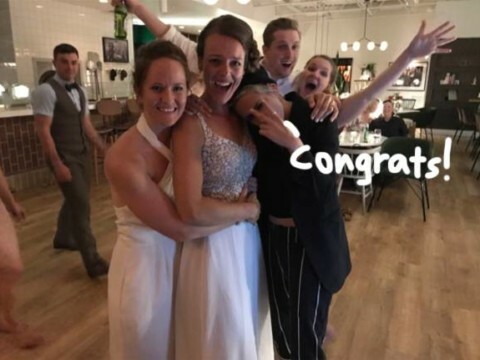 While the ceremony took place at Kirsten’s parent’s house, the reception was held at a nearby restaurant where (coincidentally) Kristen Stewart and girlfriend Stella Maxwell were nearby! Previous articleCiara Gets SLAMMED On Social Media For Allowing Baby Sienna To Ride ‘Dangerous’ Toboggan Slide In China! Next articleThe Biggest Kardashian/Jenner Business Fails! Who Should Leonardo DiCaprio Date Next?